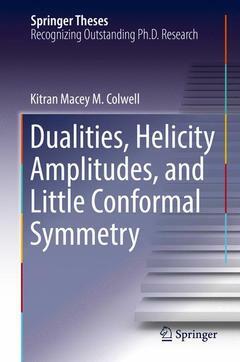 Dualities, Helicity Amplitudes, and Little Conformal Symmetry Colwell Kitran Macey M.
Auteur : Colwell Kitran Macey M.
This book develops two exciting areas of particle physics research. It applies the recent new insights about the usefulness of helicity amplitudes in understanding gauge theory to the long-standing effort to understand theories with both electric and magnetic charges. It is known that for some supersymmetric theories there is an exact duality that relates two descriptions of the physics, one where the electric charges are weakly coupled and another where the electric charges are strongly coupled. The calculations in this thesis suggest that this duality can also hold in the low-energy limit of nonsupersymmetric gauge theories. The idea of addressing the hierarchy problem of the standard model Higgs mechanism using conformal symmetry is also explored. Analogously to ?Little Higgs? models, where divergences are cancelled only at one-loop order, models are studied that have infrared conformal fixed points which related gauge and Yukawa couplings, allowing for a cancellation between seemingly unrelated quantum loop diagrams. Chapter1. Electromagnetic Duality.- Chapter2. Spinor Helicity Formalism.- Chapter3. Non-Abelian Monopoles.- Chapter4. Scattering Amplitudes.- Chapter5. Little Conformal Symmetry. Dr. Kitran Colwell received a Ph.D. in Physics from the University of California, Davis in 2016, and now has a position at Diablo Valley College, California.